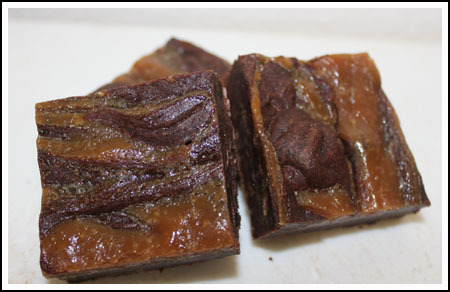 The Peanut Butter Caramel Swirled Brownies are from a Bobby Flay Showdown episode. It was Bobby Flay against a little company in Vermont called The Vermont Brownie Company and as usual, I missed the show. Luckily, somebody told me about the brownie and I went straight to the source at Food TV’s website. I wasn’t sure I’d love these. 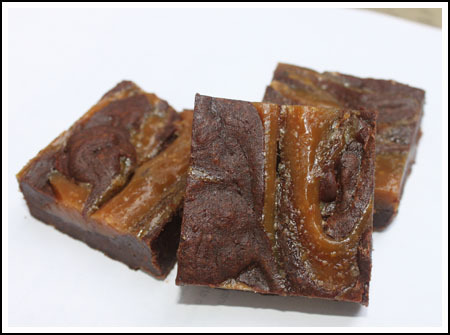 caramel swirl brownies are good, peanut butter swirl brownies are better, and even brownies swirled with peanut butter and caramel sound great. But why mix the peanut butter into the caramel? Because Bobby Flay said so, that’s why. So even though I worried mixing the caramel and peanut butter together would mess up the flavor, I did it. 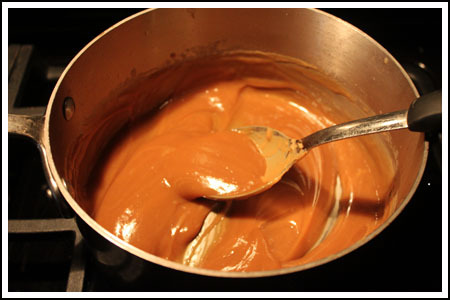 Making the caramel was fun because I had the right saucepan. I used to be scared of making caramel, but I bought a heavy duty metal All-Clad pan and love watching the sugar mixture go from clear to amber with no burning, scorching and pan-ruining. After I added the peanut butter, the mixture looked like this. The brownie part was one of those super easy whisk-and-bake recipes. Because I didn’t need a full batch, I halved it and made it in an 8 inch pan. I did make the full batch of peanut butter caramel, though. And I used more than half of it. So I had a small batch of batter and more peanut butter mixture than needed and got brownies that looked like this. I sent them to work with Todd and hope people enjoy them. They’re rich (if you can’t tell by the photo) and very, very fudgy. I’d take them over a goat cheese brownie any day. One final thought. Why did Showdown put a peanut butter brownie up against a goat cheese brownie anyway? Do they usually mix dishes or is it usually, say, chocolate chip against chocolate chip? Did anybody have luck with finding a copycat version of the goat cheese brownies? Or any advice as to how to make the goat cheese filling? I believe on this episode the girls used sugar, eggs, and the goat cheese but I hate just guessing as to the quantities of each. Thanks in advance! Happy baking everybody! Just made this brownies, they are fantastic!! I only thing I left out was the espresso powder because the three different stores I went in, never heard of it. But they came out great!! The goat cheese brownie looked amazing! You’re right though–pb caramel and goat cheese are like apples and oranges. Darn, I missed that show too. And these brownies are worth committing a crime for! Goat cheese brownies? Uh uh. I’ll pass. I love goat cheese but never thought of putting it in brownies. I think I’ll stick with Legal Vice Brownies which are “Baked” brownies with a heavy dose of bacon and bourbon. eww goat cheese? one of the foods I cannot stomach (and I am not fussy at all). I saw this episode and also wondered why Bobby went with something so totally different (as if goat cheese in a brownie is not different enough!). However, Bobby always seems to do the throwdown “His Way”…antiestablishment like. You should have seen his recent German Chocolate Cake throwdown….his was definitely not the traditional German Chocolate Cake (although it did look yummy!). I wonder if anyone out there in cookiemadnessland has personally tasted a goat cheese brownie? Did you see the Throwdown Episode on Tahiti Blondies? The team Bobby was challenging was known for making a blondie with pineapple, coconut, white chocolate, nuts, and maybe some other things. They looked really good. I’ve tried searching for a copycat recipe but can seem to find one. I love Bobby Flay’s Throwdown. My favorite was when he went up against the ladies at Levain bakery. These brownies look delicious!!!! I missed that throwdown, but these sound delicious. I want to taste peanut butter in caramel now! John, the peanut butter caramel would be great in a cookie! I liked these and know they will be popular, but I think I still favor this recipe at the link below. Butter is mixed in with the peanut butter, then the topping it poured on at the end, then topped with another drizzle of ganache. The trick here is just not baking it. If I remember correctly, Bobby used the caramel to keep the peanut butter from drying out or turning grainy, or something like that. That’s the problem I have with peanut butter cookies is that they are grainy in texture. Maybe a caramel peanut butter cookie can come from this technique? That IS interesting that it was pb/caramel swirled, because I love both separate, but not sure about together. And you’re right, I’d rather see a plain brownie against a plain brownie. Most of his shows I’ve seen are ccc to ccc, or red velvet to red velvet, etc. Hmmm.? I saw this ep too and just assumed Bobby was a big peanut butter and caramel fan and wanted something besides a plain brownie to compete with the goat cheese one. Kinda seemed like overkill. What did you think of the peanut butter/caramel mixture? They look beautiful! These look awesome! I’ve always had trouble trying to make swirled brownies look…swirly. Did you use a toothpick or a knife? Woah woah woah. GOAT CHEESE BROWNIE? This sounds like madness! Is there a recipe for these somewhere? ?